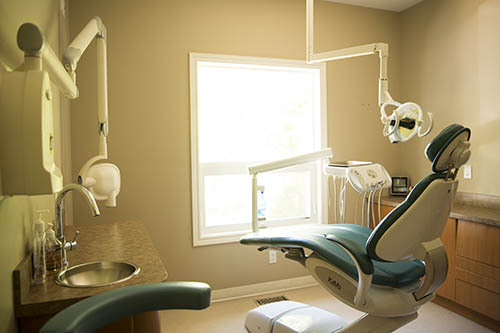 If you are fearful of injections you will be happy to hear that Dentistry in Gravenhurst uses the Single Tooth Anesthesia System® (STA), which is a combination of CompuFlo® technology and The Wand® hand piece that dramatically reduces the pain of injections in the sensitive areas of the mouth like the palate and front of the mouth. This system allows for a more predictable, comfortable injection of anesthetic and significantly reduces injection pain. Doctors have long known that the main cause of discomfort or pain during an injection is the flow of the anesthetic into your tissues. 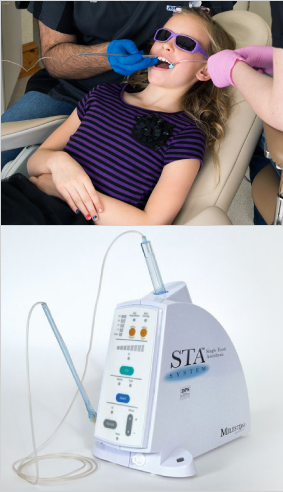 The STA® System is a controlled anesthesia system that allows the doctor precise control over the location and amount of anesthesia that is administered. This means that the injection is guaranteed to be slow and steady and therefore comfortable. Most people who have had a bad experience with injections think that needles sting because the skin is pierced, but this is usually not so! Most often, the sting was caused because the anesthetic was fired in too quickly. Using the “magic pen” we can avoid this by controlling the injection with the wand. This can be very reassuring for people with previous bad experiences.